I do not know whether it will be possible, one day, for all countries of the region to formally become part of the European Union exclusively owing to the pragmatic readiness to preserve regional stability, but it is quite certain that this will not truly happen without a sincere, not only verbal, embracing of European standards, and unless the field of media freedoms in them is expanded. Only a sincere adoption of European standards – and that includes media freedoms as well – can guarantee true stability, and only in such circumstances can stability rest on the unquestionable will of the citizens. This is why I believe that this gathering (the Civil Society Forum in Trieste, e.d.) should jointly urge all European institutions and all EU member states to employ the same energy they do to bring various regional political leaders together to negotiate, upon upholding media freedoms as well. It is true that demands pertaining to media freedoms are regularly mentioned at most meetings with regional political leaders, but it is also true that these same individuals, once they return to their offices, continue to treat the media which are not under their direct control as they usually do – by bearing pressure upon them and trying to exhaust them financially, so as to make sure that the public gets the message they want them to receive. The media in the region are mostly stifled by state institutions, through the use of budget funds, i.e. public tax funds belonging to the citizens. That is, various power centers, as a rule connected to the state, have enormous sums at their disposal. Using and abusing the money they control and various instruments of power – tax authorities and courts, for example – they influence the business operations of all companies, including the editorial policies of targeted media companies. In Serbia, the country I come from, a vicious war among tabloids is currently raging. Namely, one of such tabloid began strongly criticizing the authorities. 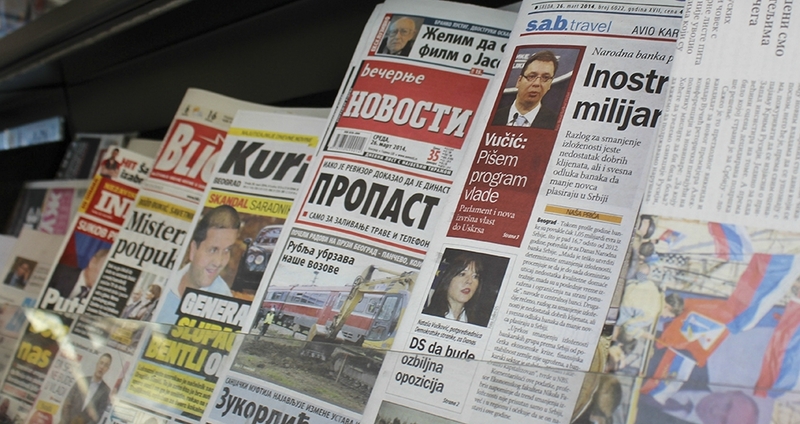 Other tabloids and TV stations, privately owned by persons close to the authorities, responded with an equally ferocious campaign against the “transgressor.” One of the editors of the latter group even said he will form a journalistic association with a goal to protect the Serbian president from media attacks. This war is ruthless because the tabloid that is criticizing the government has a high circulation and is quite influential. This example shows that when someone dares to “leave the club,” extraordinary measures are used to contain the damage. Journalistic associations are shying away from all this, in accord with their view that not a single participant in this dirty war, quite detrimental to public interest, is abiding by even the most basic rules of the profession. The tabloids and TV stations I mentioned have been turned into efficient means for stifling “dissent” on the media scene. For years they have been waging campaigns against outlets that are not fully controlled by the authorities. The reasons are the same – the “dissenting” media persistently question the authorities’ performance and refuse to submit to their control. The difference rests in the fact that the independent media mostly respect the norms of their profession, but are weak economically and have a very limited influence. The key issue thus is how to strengthen the media bloc which is abiding by the professional rules and not shying away from openly tackling the key problems of society, including corruption. The answer, in my view, lies in the creation of networks of independent media thereby enhancing their public influence. Social conditions for such action are gradually maturing because ever more citizens, especially at the local level, are realizing that their true problems are not being solved. Connecting a large number of the “weak and the poor” will, however, only create an association of the relatively helpless, ready to offer each other a helping hand but incapable of making a difference. To create groups that would have more public influence, what is needed are additional investments which the media in Serbia, and, as far as I know, in other countries of the region too, do not have at their disposal at the moment. What is needed, also, are clear and firm measures to prevent a selective implementation of laws. A recent study of the newly established "Regional platform for media freedom in the Western Balkans" warns about the increased use of physical violence as a tool of intimidation against journalists. On this topic browse our Resource Centre . The traditional media have been losing their audience irretrievably, and this allows the authorities to direct the scarce money serving the media market where it is most useful for them, breaking the laws to protect the outlets close to them. In Serbia, for example, there are two privately-owned and one state-run news agency. Although the state-run agency was formally closed in accordance with the laws on privatization, it still operates on the market and through disloyal competition is destroying the other two agencies. Having all this in view, I am calling for the creation of a strategy that would support the media in the region and promote conditions wherein the public will receive objective, prompt and accurate information without hindrance. For this, legislation should be improved and strict respect for the law ensured. What is also needed are foundations that would support the development of professional news media. Stability is essential, but “stabilitocracy” in itself cannot yield lasting results. We want to join Europe, but we want to do that as societies in which European values – including media freedoms and human rights – are truly respected. We believe that it is the last moment for Europe, too, to pay closer attention to this matter.